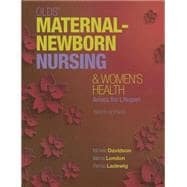 This title is also available with MyNursingLab—an online homework, tutorial, and assessment program designed to engage students in the Maternal/Newborn Nursing course and improve results. Its guided learning path is proven to help students think like a nurse as they move beyond memorization to true understanding through application. NOTE: You are purchasing a standalone product; MyNursingLab does not come packaged with this content. If you would like to purchase both the physical text and MyNursingLab, search the Pearson website. MyNursingLab should only be purchased when required by an instructor. Students, if interested in purchasing this title with MyNursingLab, ask your instructor for the correct package ISBN and Course ID. Instructors, contact your Pearson representative for more information. Michele R. Davidson completed her ADN degree from Marymount University and worked in multiple women’s health specialty areas including postpartum, newborn nursery, high-risk nursery, labor and delivery, reproductive endocrinology, gynecology medical-surgical, and oncology units as a registered nurse while obtaining a BSN from George Mason University. Dr. Davidson earned her MSN and a nurse-midwifery certificate at Case Western Reserve University and continued to work as a full-scope nurse-midwife for 16 years. She has delivered over 1,000 babies during her career as a nurse-midwife. She completed her PhD in nursing administration and healthcare policy at George Mason University (GMU) and began teaching at GMU in 1999 while continuing in her role as a nurse- midwife. Dr. Davidson serves as the Coordinator for the PhD program in the School of Nursing. She has an interest in women’s mental health and focuses her research in perinatal and postpartum mood and anxiety disorders. Dr. Davidson also has an interest in the care of individuals with disabilities and serves as a member the Loudoun County Disability Advisory Committee and is a disability advocate in her community. She was a member of the American College of Nurse-Midwives Certification Council, the body that writes the national certification examination for certified nurse-midwives. She is a member of numerous editorial and advisory boards and has a passion for writing. In 2000, Dr. Davidson developed an immersion clinical experience for GMU students on a remote island in the Chesapeake Bay. In 2003, she founded the Smith Island Foundation, a nonprofit organization in which she served as executive director for eight years. Dr. Davidson has also completed certifications in lactation consulting, forensic nursing, and surgical first assistant. In 2012, her book, A Nurse’s Guide to Women’s Mental Health, won an American Journal of Nursing Book Award. In her free time, she enjoys spending time with her mother, writing, gardening, Internet surfing, and spending time on Smith Island with her nurse-practitioner husband, Nathan, and their four active children, Hayden, Chloe, Caroline, and Grant. Dr. Davidson and her family love the Eastern Shore of Maryland and continue to be part-time residents of Smith Island. Marcia L. London received her BSN and School Nurse Certificate from Plattsburgh State University in Plattsburgh, New York, and her MSN in pediatrics as a clinical nurse specialist from the University of Pittsburgh in Pennsylvania. She worked as a pediatric nurse and began her teaching career at Pittsburgh Children’s Hospital Affiliate Program. Mrs. London began teaching at Beth-El School of Nursing and Health Science in 1974 (now part of the University of Colorado, Colorado Springs) after opening the first intensive care nursery at Memorial Hospital of Colorado Springs. She has served in many faculty positions at Beth-El, including assistant director of the School of Nursing. Mrs. London obtained her postmaster’s Neonatal Nurse Practitioner certificate in 1983 and subsequently developed the Neonatal Nurse Practitioner (NNP) certificate and the master’s NNP program at Beth-El. She is active nationally in neonatal nursing and was involved in the development of National Neonatal Nurse Practitioner educational program guidelines. Mrs. London pursued her interest in college student learning by taking doctoral classes in higher education administration and adult learning at the University of Denver in Colorado. She feels fortunate to be involved in the education of her future colleagues and teaches undergraduate education. Mrs. London and her husband, David, enjoy reading, travel, and hockey games. They have two sons. Craig, who lives in Florida with his wife, Jennifer, works with Internet companies. Matthew works in computer teleresearch. Both are more than willing to give Mom helpful hints about computers.